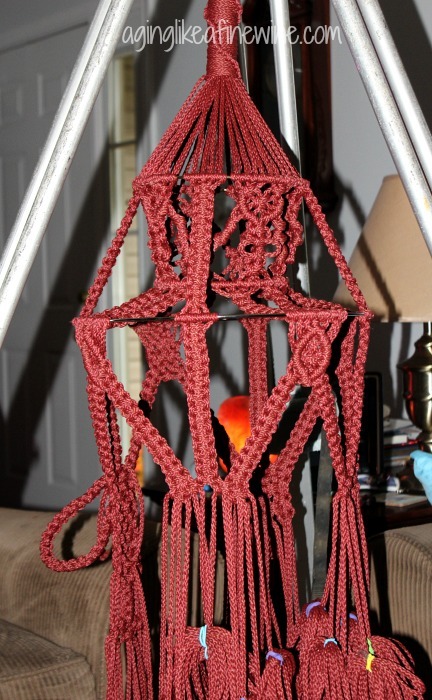 I love my completed macrame hanger which is now hanging in a corner of my dining room. It literally hung in my living room for 3 months in various stages of completeness before it made it to my dining room ready to hold wine or juice or champagne or? I saw this in an old macrame book and it was so unique that I wanted to give it a go. I cut my cords, put them through the ring evenly and tied one knot to secure them. I always wrap the ends up at that point and secure them with rubber bands. The cords are so long it would be impossible to work with them unless you wrap them up to a shorter length. My husband set up his tripod so I could sit on the couch and work on my project. It was moving along quickly until I realized I had not purchased all of the rings that I needed, so work was stopped while the rings were ordered. Then because of other priorities, it just kept getting pushed to the back burner until I finally said enough is enough, this thing that looks like some lurking jellyfish monster has got to leave my living room! So I set aside some dedicated time to get this project done! And I am now enjoying my macrame hanger in a corner of our dining room. 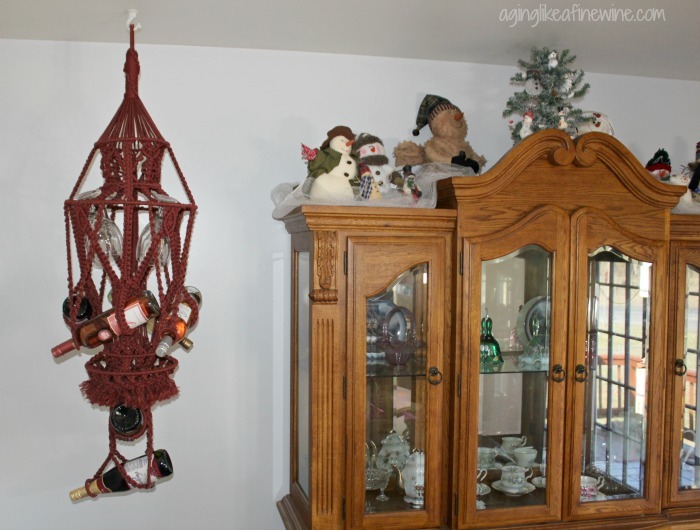 I’m not a big wine drinker and if you aren’t either, a good thing about this macrame piece is that you can use it to hold any type of bottle that is the basic size of a wine bottle. 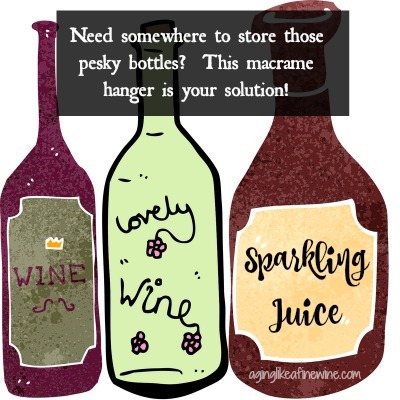 Or just keep the same wine bottles in it and dust them once in a while! HaHa! I think it’s time to put my snowmen away and bring out some spring decor. Think spring! Think spring! I have to say that I like this pattern, except there are many places that you have to cut the cords and then glue the ends to hold them secure. Maybe I’m just greatly lacking in my hot glue gun skills, but I feel that every one of my glued ends turned out sloppy looking. No one else would notice unless they really got up close to check it out, but I know they’re there. And you know how that is! Macrame continues to grow in popularity once again and I’m seeing lots of beautiful things on Pinterest. 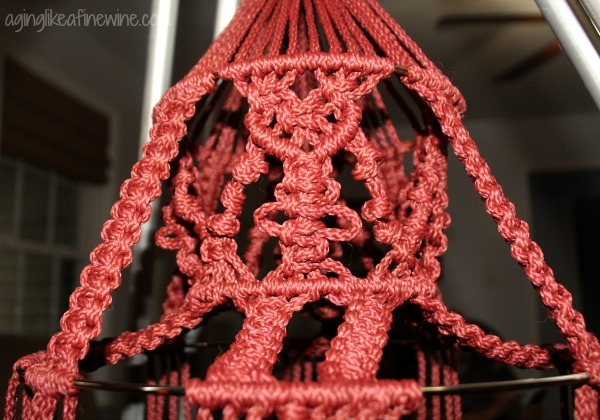 Do you like macrame or have you given it a try? I made a mobile for my grandbaby that was very easy, pretty and still in use. You can see it here. Have a wonderful week and happy DIYing! This pattern was a little difficult, not one I would make again. I think I’ll create my own. Try it Dee! 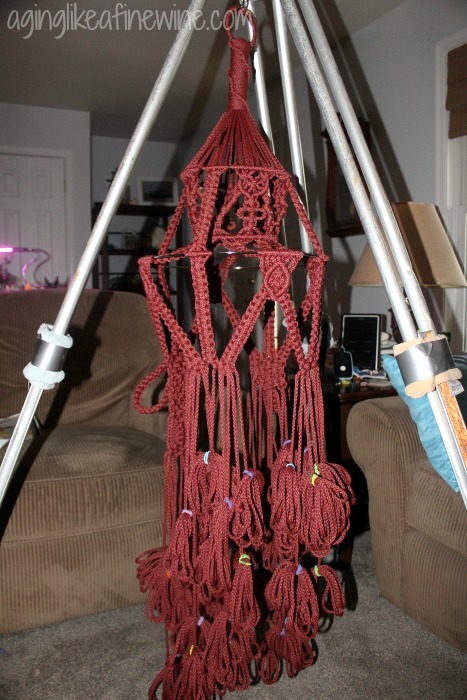 I enjoy doing macrame, it was a big thing in the 70’s. Very unique, isn’t it! I’m glad you like it.